Pottag rebuild II trouble with prior work. Work continues on the Pottag. As I began to rebuild the Pottag, it became apparent that then it was re-lacquered the process caused many solder joint to fail. ( too hot ??) Around the valve cluster there have been 23 failed solder joints. Above the pix shows four re-solder points to re-work joints that have failed. Several heavily patched branches were replaced, (one had three patches). I have not kept an extensive collection of pix of the work done. There have been two other horns on the bench and its been too hot to fool around with starting ans stopping to take pix. The Pottag is now a detachable flare with a Conn 6d, 9d, 10d ring set. The valves have been plated and hopefully when together it will be a good horn. Rebuilding a horn is not unlike firing pots in a kiln. When completed you find out what you’ve got. 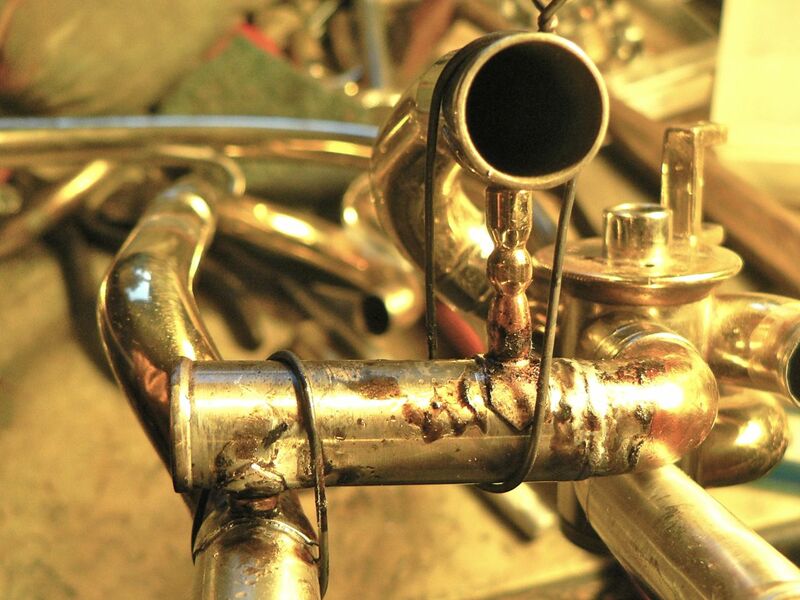 Your job is to make sure that the horn is completed with good solder joints, the alignment is pleasing, and the valves have an excellent seal, but how the horn plays is only determined when you give it the first honks, and then to blow it in (What ever that means…) It seems that some minor molecular adjustments occur when the horn is played for a while. If this is a real thing or a mental thing, I don’t know, I will go on the record and state there is seen to be a bit of smoke an mirrors here and it is beyond my limited mind. I’m sure the engineer types can give us an understandable thesis to consider….I wonder what Lawson would say…. If you have opinions or ideas, please share them.